Vancouver, British Columbia–(Newsfile Corp. – December 6, 2018) – EMX Royalty Corporation (TSXV: EMX) (NYSE American: EMX) (the “Company” or “EMX”) is pleased to announce the execution of a Regional Strategic Alliance agreement (the “Agreement”) between its wholly-owned subsidiary Bronco Creek Exploration, Inc. (“BCE”), and South32 USA Exploration Inc. (“South32”), a wholly-owned subsidiary of South32 Limited. The Agreement provides annual funding for generative work and acquisitions over a two year period, as well as a framework to advance projects of interest. Generative work will focus on copper and other base metal projects within the Laramide and Tertiary magmatic arcs of Arizona, New Mexico and Utah. Projects advanced to the drill program stage may be selected as Designated Projects. Designated Projects will advance under separate option agreements providing for work commitments and cash payments to EMX during South32’s earn-in period, and upon earn-in, a 2% net smelter return (“NSR”) royalty interest and pre-production and milestone payments to EMX’s benefit. South32 has initially selected five EMX copper projects in Arizona to begin advancing toward the drill program stage. Please see the attached map and www.EMXroyalty.com for more information. Alliance and Commercial Terms Overview (all dollar amounts in USD). Under the terms of the Agreement, which has an initial term of two years, South32 will provide annual funding for generative work performed by EMX personnel to identify properties for exploration work (“Alliance Exploration Properties” or “AEPs”) within the Regional Strategic Alliance Area of Interest (“AOI”) that consists of the states of Arizona, New Mexico, and Utah, but excludes South32’s Hermosa project in southern Arizona. EMX personnel will conduct exploration activities on AEPs with additional funding from South32 in order to identify projects suitable for designation as Designated Projects. Each Designated Project will be covered by a separate option agreement pursuant to which South32 can acquire 100% of the project on the terms described below. All generative and AEP exploration activities will be guided by a Technical Committee consisting of two members from each company. South32 will provide $800,000 per year to cover the generative work and the salaries of EMX personnel involved in AEP exploration work. South32 will also provide a separate annual acquisition fund of $200,000 to pay for the acquisition of new properties as approved by the Technical Committee. AEP exploration work will be funded separately through cash calls to South32 in amounts directed by the Technical Committee. Designated Project Option Agreement Terms (all dollar amounts in USD). Each option agreement covering a Designated Project will provide that South32 can earn 100% interest in the project by reimbursing EMX’s holding costs upon execution of the option agreement, and making option payments totaling $525,000 and completing $5,000,000 in exploration expenditures during the five-year term of the option agreement. 666,000 lbs of copper (or the cash equivalent) upon completion of a feasibility study. Initial Alliance Exploration Projects. Five Arizona porphyry-copper projects have been selected as AEPs by South32, including Midnight Juniper, Jasper Canyon, Sleeping Beauty, Dragons Tail, and Lomitas Negras. EMX and South32 are commencing work programs on the initial AEPs, as well as initiating a generative program to identify new projects for acquisition. 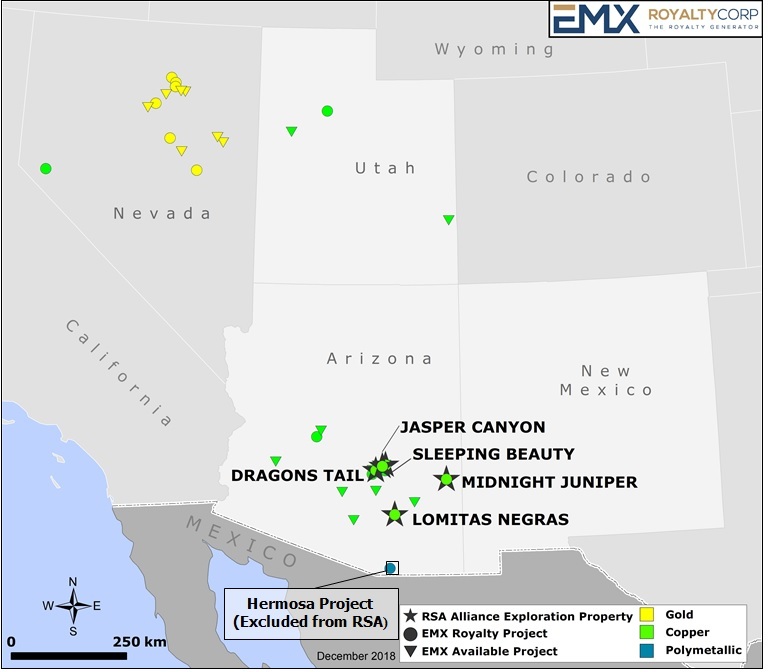 Note, in the following project descriptions, although the referenced nearby mines and deposits provide geologic context for EMX’s properties, this is not indicative that the EMX properties host similar endowments of mineralization. Midnight Juniper. The Midnight Juniper project lies at the north end of the Clifton-Morenci mining district, approximately one kilometer northwest of the Morenci open pit copper mine. The project geology consists of a dissected plateau of Tertiary age volcanic cover rocks overlying a series of Paleozoic sedimentary and Proterozoic metamorphic rocks that are exposed in an arcuate pattern at lower elevations along stream courses. Paleozoic carbonate rocks contain a number of manganese oxide-rich base metal occurrences in northeast oriented vein, replacement, and breccia bodies typical of the distal expression of porphyry copper systems. EMX’s reconnaissance mapping shows that these occurrences appear to vector towards a suspected porphyry source lying under Tertiary cover rocks in the center of the Midnight Juniper land position. Jasper Canyon and Sleeping Beauty. The Jasper Canyon and Sleeping Beauty projects are located in the Globe-Miami mining district. Both properties lie on the flanks of the Schultz Granite intrusive complex, which is associated with numerous past and current producing copper mines and deposits in the Globe-Miami and Superior mining districts. Porphyry copper deposits in this region have been dismembered by numerous post-mineral faults that displace upper levels of the mineralized systems northeastward. The Jasper Canyon and Sleeping Beauty projects lie at the east end of a northern trend of fault bounded deposits that include Pinto Valley, Diamond H and Copper Cities. The Jasper Canyon project lies along the easternmost portion of this trend and represents a fault-bounded and largely covered portion of the suspected upper levels of a porphyry copper system in a previously unexplored portion of the district. The Sleeping Beauty project lies to the west of Jasper Canyon, and directly north of the Copper Cities open pit copper mine, and is interpreted to contain down-dropped blocks of mineralization north of the Sleeping Beauty fault. Other fault-bounded copper deposits in the district at similar structural levels include Copper Cities, Miami East, Van Dyke, and Old Dominion. Dragons Tail. The Dragons Tail project is located in the Superior mining district, approximately eight kilometers north of the Resolution copper deposit and five kilometers southwest of Pinto Valley. EMX identified a 1.6 kilometer long zone of quartz-sulfide alteration within Proterozoic sedimentary rocks during reconnaissance work. The outcrops of quartz-sulfide veining lie beneath tilted Tertiary age volcanic and conglomeratic cover rocks. Historic drilling on the east side of the property intercepted transported copper-oxide mineralized clasts within Tertiary conglomerates, which suggests the source of the copper lies to the west of the drilling and likely down dip of the mineralized exposures. Lomitas Negras. The Lomitas Negras project is located approximately ten kilometers southeast of the town of San Manuel, in a broad area of post-mineral cover rocks. The property is ringed by Laramide-age intrusive rocks and porphyry copper/skarn deposits that include San Manuel-Kalamazoo (~20 kilometers north), Copper Creek (~25 kilometers northeast), and Oracle Ridge (~10 kilometers southwest). Nearby outcrops exhibit alteration and anomalous base metal mineralization that characteristically occurs on the margins of porphyry copper systems. EMX’s recognition of the altered outcrops, combined with a new interpretation of the extensional structural setting of the area, led to the identification of concealed porphyry copper targets beneath the post-mineralization pediment cover. The Regional Strategic Alliance Agreement with South32 is an excellent example of the execution of EMX’s royalty generation business model. The Company’s organically generated porphyry copper projects were acquired on open ground in productive mining districts, with value established through low cost, early-stage exploration work. The Agreement’s provisions for generative funding are coupled with the future upside potential for project work commitments, pre-production payments and retained royalty interests based upon exploration success to EMX’s and South32’s mututal benefit. Mr. Dean D. Turner, CPG, a Qualified Person as defined by National Instrument 43-101 and consultant to the Company, has reviewed, verified and approved the disclosure of the technical information contained in this news release. This news release may contain “forward looking statements“ that reflect the Company’s current expectations and projections about its future results. These forward-looking statements may include statements regarding perceived merit of properties, exploration results and budgets, mineral reserves and resource estimates, work programs, capital expenditures, timelines, strategic plans, market prices for precious and base metal, or other statements that are not statements of fact. When used in this news release, words such as “estimate,“ “intend,“ “expect,“ “anticipate,“ “will“, “believe”, “potential” and similar expressions are intended to identify forward-looking statements, which, by their very nature, are not guarantees of the Company’s future operational or financial performance, and are subject to risks and uncertainties and other factors that could cause the Company‘s actual results, performance, prospects or opportunities to differ materially from those expressed in, or implied by, these forward-looking statements. These risks, uncertainties and factors may include, but are not limited to: unavailability of financing, failure to identify commercially viable mineral reserves, fluctuations in the market valuation for commodities, difficulties in obtaining required approvals for the development of a mineral project, increased regulatory compliance costs, expectations of project funding by joint venture partners and other factors. Readers are cautioned not to place undue reliance on these forward-looking statements, which speak only as of the date of this news release or as of the date otherwise specifically indicated herein. Due to risks and uncertainties, including the risks and uncertainties identified in this news release, and other risk factors and forward-looking statements listed in the Company’s MD&A for the quarter ended September 30, 2018 (the“MD&A”), and the most recently filed Form 20-F for the year ended December 31, 2017, actual events may differ materially from current expectations. More information about the Company, including the MD&A, the 20-F and financial statements of the Company, is available on SEDAR at www.sedar.com and on the SEC’s EDGAR website at www.sec.gov. Figure 1: AEP projects and RSA AOI (Arizona, Utah, and New Mexico) with South32. This entry was posted in Base Metals, Energy, Precious Metals, Project Generators on December 6, 2018 by admin.